Doctor Strange, the 14th installment in the Marvel Cinematic Universe, is successful in an entirely duplicitous manner. While not straying far from the Marvel formula, the film injects new life into the MCU with its breathtaking visuals and expansion of underlying rules of the universe. No longer relying on science as an explain-all, Marvel Studios leans into magic and mysticism with alternate dimensions, dark lords, and time manipulation all at the forefront. It’s a paradigm shift that paves the way for the rest of Phase 3 (notably Thor: Ragnarok and Guardians of the Galaxy Vol. 2), but above all else, it’s beautifully fun. Doctor Stephen Vincent Strange, an eccentric sorcerer based out of Greenwich Village, was the brainchild of artist Steve Ditko (famously known for co-creating Spider-Man). Equipped with mastery of the black arts, Doctor Strange fended off paranormal and extradimensional threats to reality after extensive training under The Ancient One, Earth’s Sorcerer Supreme. Ditko imagined a vivid extradimensional world, a geography of vibrant colors and impossible structures populated with demons and spirits attempting to barge into our world. 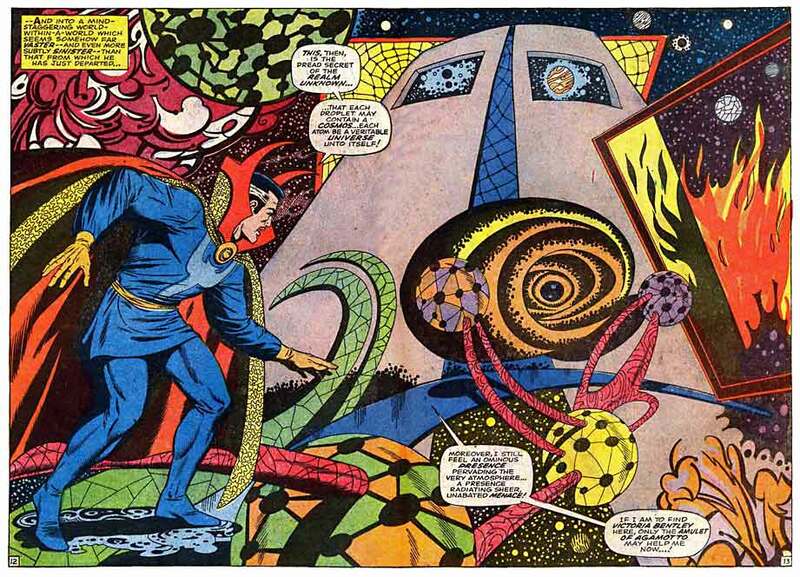 His distinctive art in Doctor Strange’s first comics (starting in Marvel’s Strange Tales #110) became the favorite among LSD-dropping hippies of the 60’s and 70’s. It’s this visual history that director Scott Derrickson taps into for the film’s aesthetic, and Doctor Strange is foremost a visual journey into the unbelievable. Not only does it capture both the brilliance and impossibility of Ditko’s world, but the language of motion for the characters within that world is comprehensible yet fantastical. While cities fold in on itself in kaleidoscopic fashion, characters can easily be followed as they leap and battle with mystical energies. Later, when the story takes us into the multiverse’s Dark Dimension, our reality is swapped out for a wholly unknowable quantum existence, a polychromatic visual assault that calls back to 2001: A Space Odyssey, matured for modern cinema. There’s a lot to take in when our characters are hopping between dimensions, but never does the audience feel distracted from the action. The setpieces are excellently paced, slowing down to allow the wonderment of these fantastical worlds to sink in, and then speeding up to provide gravity-defying action set in moving M.C. Escher architectures. All of this is accomplished without the camerawork being herky-jerky, creating a seamlessness that can sometimes be lost in Marvel battle scenes. The film’s soundtrack advances the film’s 1960’s psychedelic pastiche with a heady, progressive-rock-influenced score by Michael Giacchino. 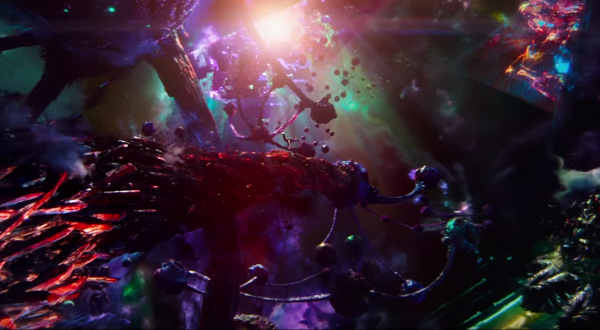 It borrows eastern music elements while Doctor Strange trains in Nepal, and the rock elements blend Led Zeppelin’s more mystical overtures like “Battle of Evermore” with distortion and bending techniques used by David Gilmour of Pink Floyd. In fact, the soundtrack’s biggest coup is Floyd’s “Interstellar Overdrive” which is heard in the film’s first act. The sound editing is some of the best work in the MCU as well, as surround, reverb and echo effects are used poignantly as The Ancient One catapults Strange through various realities. Though the sensory experience is the film’s greatest success, the narrative is unflinchingly solid and surprisingly coherent given the lack of rules governing the mystical universe. The story itself has all the hallmarks of an MCU origin. A fantastical prologue lays the mythological foundation the story is built on (Thor). An arrogant protagonist at the top of his profession suffers a catastrophic accident (Iron Man). The hero then studies under a powerful teacher, hoping to take up that mantle (Ant-Man). Finally, the hero battles against his corrupted mirror image, a villain with the same power set as the hero (too many to count). But while it follows this blueprint, the visual storytelling and charming performances helps keep the plot from sinking into routine. The film immediately begins with the villain Kaecilius (Mads Mikkelsen) stealing sacred scrolls from Kamar-Taj, the library of the Ancient One (Tilda Swinton). The Ancient One gives chase, resulting in a breathtaking urban battle scene while buildings and roads fold in and blossom open on themselves. Back in New York, Doctor Stephen Strange (Benedict Cumberbatch) suffers irreparable nerve damage in his hands during a car accident, effectively ending his career as a neurosurgeon. Strange falls into despair, ostracizing his ex-romantic interest (and seemingly only friend), Dr. Christine Palmer (Rachel McAdams). After thoroughly dismissing her from his life, he grasps at one last straw to save his hands: a mystic halfway across the world who supposedly helped a man (played by Benjamin Bratt) walk after full paralysis. 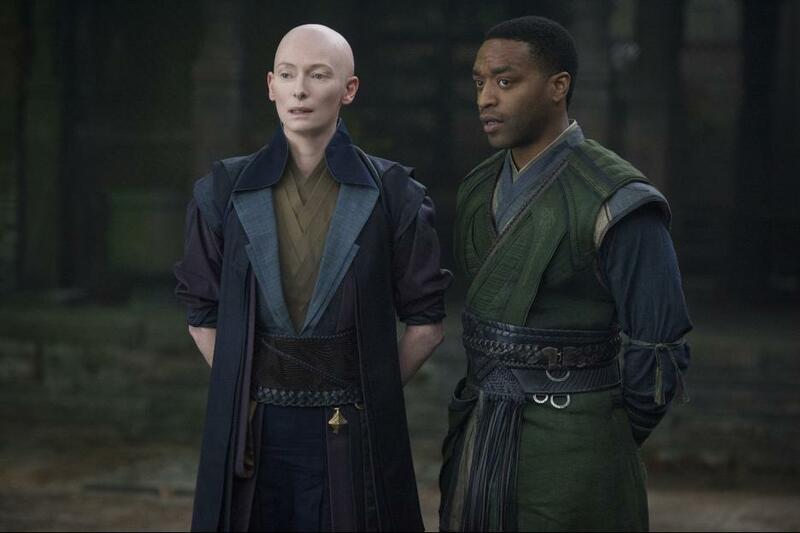 Using what little resources he had left, Strange travels to Katmandu, Nepal, where after some blind hunting, finally encounters a man named Mordo (Chiwetel Ejiofor) who leads him to the Ancient One, an ancient Celtic mystic played brilliantly by Tilda Swinton. Strange looks askance at this sorceress and her teachings, being a man of learned science. But with a simple blow to the chest, Doctor Strange’s “astral form” (akin to soul) is pushed out of his body, as he watches his physical form slowly fall from the blow. An instant later, Doctor Strange is blasted through the multiverse, an acid-like experience as he traverses dimensions and watches his grasp of reality melt away in visual splendor (including a mind-blowing shot of his hands growing hands which in turn grow hands ad infinitum). And thus begins the tutelage of Doctor Strange, with the second act amounting to the superhero equivalent of a training montage. Mordo and resident librarian Wong (Benedict Wong) are along for the journey, providing key exposition dumps on powerful artifacts, magic spells, and the Dark Dimension, which is lorded over by Dormammu. It is this being that Kaecilius worships most of all, and what’s more, Kaecilius believes the Ancient One to have some secret relationship with the dark lord. The story from there bounces from Kamar-Taj to the three sacred Sanctums located in London, New York (known as the Sanctum Sanctorum), and Hong Kong. The ending combines both the gravity-unbound action and psychedelic dreamscapes for a satisfying, nuanced conclusion not often found in magnificent blockbusters. Along the way, Strange earns, or rather befriends, the Cloak of Levitation, one of the sacred relics of this corner of Marvel mythos. 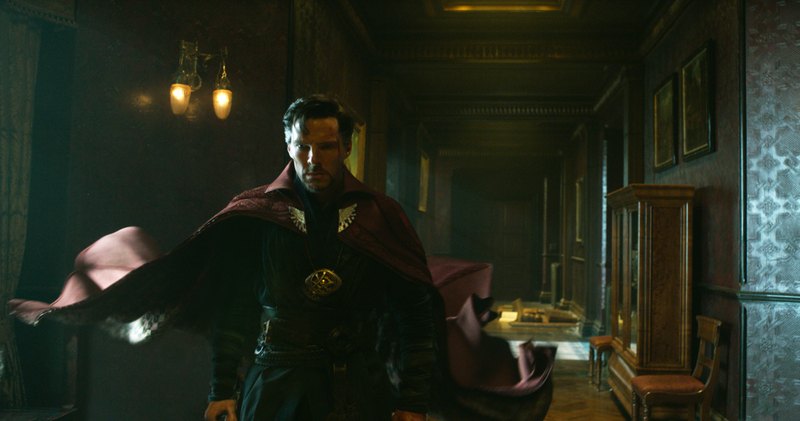 The Cloak, along with the Eye of Agamotto, are iconic effects of Doctor Strange, and in the Cloak’s case, has a sentience that conjures memories of Carpet from Aladdin. The Eye of Agamotto, the most sacred of vestiges in The Ancient One’s temple, also plays a role in the film and looms large over later Marvel installments. Ultimately, the strength of the narrative rests heavily on the performances in the cast. Benedict Cumberbatch is perfectly droll in his turn as Stephen Strange, with a Tony Stark-like wit and ego but also an aloofness more befitting the emotionally-distant doctor. 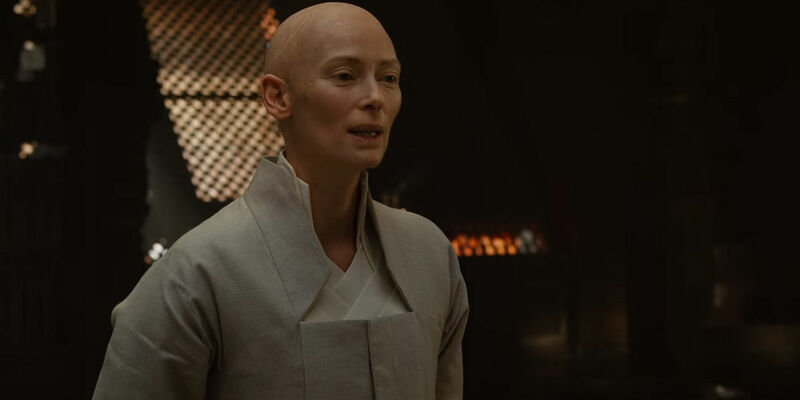 Tilda Swinton is brilliant as the unfortunately whitewashed Ancient One (more on this later), bringing the necessary quirkiness to the warrior monk who instructs Strange in the ways of mysticism. Swinton has the most developed supporting female role in a Marvel movie since Black Widow in The Winter Soldier. And Chiwetel Ejiofor and Benedict Wong bring the somber gravity (specked with humor) necessary for the roles of Mordo and Wong respectively. While they primarily function as exposition, there’s adequately robust characterization there which allows for engaging interactions between the characters. Unfortunately, fellow cast members Rachel McAdams and Mads Mikkelsen are underutilized given their abilities. McAdams executes just fine for her part, but will ultimately be another in the long line of forgettable romantic touchpoints for our male protagonists. It is satisfying, at least, to see her not fall back into love with the doctor given his incredibly harsh treatment of her after his accident. Mikkelsen, similarly, is another Marvel villain who is essentially “what would happen if the titular hero went bad?” Mikkelsen is a singularly talented actor, so to see him not used to his potential is a shame. It is worth noting that Kaecilius is a minor villain in Doctor Strange’s rogues gallery, and the film seems to be more invested in building towards Strange’s more iconic villains down the road. Marvel Studios’ Doctor Strange is another successful installment in the comic giant’s cinematic universe. As the 14th film in the series, it gracefully works in established components and stylings of the MCU while marking a seismic shift in the governing rules of this universe. It’s exceptional use of visuals (practical stuntwork mixed with vibrant CGI) and well-paced storytelling make it a strong film in its own right while also placing it in the inner circle of the MCU’s best films to date. It’s worth taking a moment to discuss the whitewashing of Tilda Swinton’s Ancient One character. 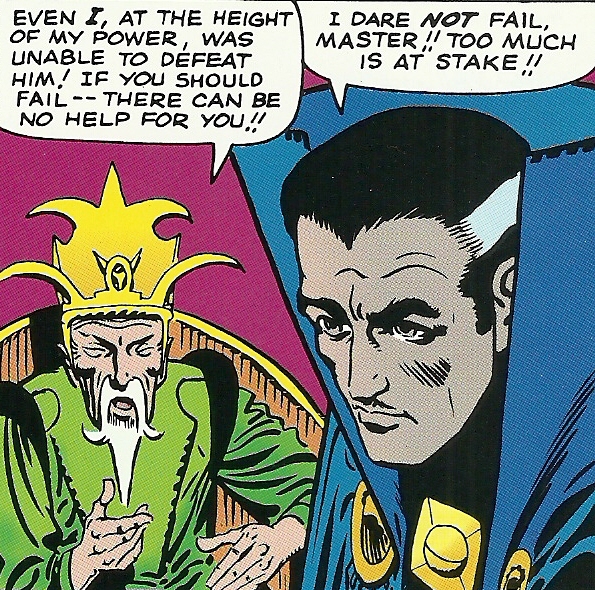 The original Ditko depictions from the 1960s rested heavily on orientalism and caricature in its expression of the Ancient One, complete with Fu Manchu mustache and Asian wardrobe. It’s difficult to blast 50-year-old art for not being ahead of the moral zeitgeist (even if it was demonstrably wrong), but it is an aspect that the creators had to grapple with in order to bring Doctor Strange to life in 2016. Swinton is powerful and charming, something we’ve come to expect from the accomplished actress. And credit where due, genderbending the Ancient One role was a positive move, given the relatively small and male-dominated cast. Swinton’s Ancient One is an actualized character, complete with her own motivations and abilities that exceed that of even Strange. While she does have to play the mentor role to Strange, there is never a feeling she exists only to support the white male lead, which is a strong mark for her and the writing of the character. Meanwhile, the men of color (Mordo and Wong) are well adapted from their comic origins. Mordo was originally a white (Transylvanian) character, and in Wong’s case, an Asian caricature manservant is transformed into a fleshed-out librarian. These are all positives to see in a cinematic universe that is still predominantly white and predominantly male. However, as an Asian American myself, I have to admit disappointment over this missed opportunity to cast an Asian person in this role. The Marvel Cinematic Universe lacks any significant Asian representation, save a few minor characters scattered about (Hogun from Thor, Helen Cho from Age of Ultron, and Jim Morita’s character in The First Avenger are the only ones that immediately come to mind). Art is at its best when it reflects reality, yet apparently most heroes in the entire universe tend to be white men. Women of color, non-black minorities, and LGBTQ persons are still woefully underrepresented in the MCU, which is a shame given the number and makeup of Marvel fans. It’s a delicate balance of course; audiences are free to demand diversity (and it is important to do so), but art also is the vision of its creators and shouldn’t be subjected to the whims of its consumers. The conversation gets further complicated by the fact that this isn’t art in a vacuum, but art in a capitalist world; a world with these movies being some of the most lucrative properties to ever exist. While Marvel has done some commendable work with its characters of color and women to date, after 14 movies, it is unacceptable to not have one movie led or titled after a non-white, non-male character. It’s a complex situation that can’t be answered in a single film review, but it’s worth watching as the MCU moves through a Phase 3 that finally does have a black lead (Black Panther) and female leads (Ant-Man and The Wasp and Captain Marvel) — and those projects are being led by black and female creators, which is another key piece to the puzzle. Right before Strange’s car accident, he is taking calls on potential medical cases to undertake. One of them, an Air Force Colonel suffering spinal injuries while wearing experimental armor, seems to reference the injury suffered by James Rhodes a.k.a. War Machine during the airport battle in Captain America: Civil War. Another case mentions a woman struck by lightning, which could be a hint towards the upcoming Captain Marvel film starring Brie Larson. In the film’s second act, Strange suffers a serious stab wound and must seek medical aid from Palmer at the hospital. While she operates on him, Strange appears in his astral form to help direct Palmer on where to make the correct incisions. 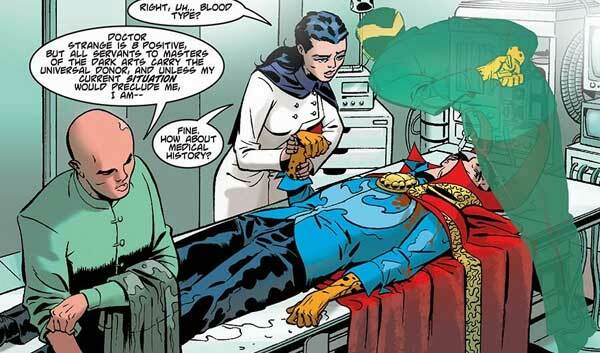 This scene draws heavily from The Oath, a popular Doctor Strange comic by Bryan K. Vaughn, where Strange is near death and must help with the operation to save his own life. While battling with Kaecilius in the Sanctum Sanctorum, Doctor Strange is seen reaching for an axe before the Cloak pulls him towards another weapon. Using an axe and other classic medieval weapons has been a staple of the current Doctor Strange comics by Jason Aaron, and some of Mordo’s comments in the post-credits scene hint that they may incorporate some of Aaron’s “Last Days of Magic” story into a subsequent film. 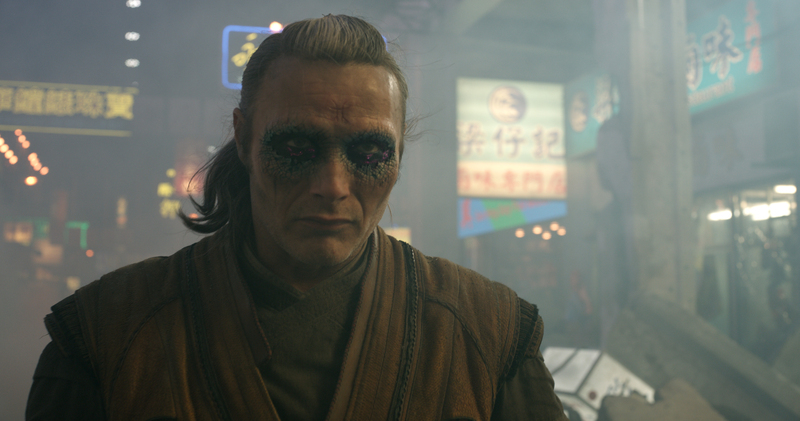 As mentioned earlier, Kaecilius is not one of the more renowned villians of Doctor Strange. The most well-known are Dormammu, who appears in the film’s final act, and Mordo himself, who is seen taking an evil turn at the end of the film. Mordo is Strange’s first and oldest villain, so one can expect him to be prominent in any sequels. The Eye of Agamotto reveals itself to be the Time Stone, one of the six Infinity Stones and the fifth to appear on screen in the MCU. With it Doctor Strange is able to reverse the flow of time to help undo the damage caused by Kaecilius and foil Dormammu. This leaves one more Stone to be introduced between now and Avengers: Infinity War, when Thanos will vie for supreme rule over existence. Lastly, the midcredits scene sees Doctor Strange entertain a visitor: Chris Hemsworth’s Thor. Production stills have hinted that Thor and his family were walking around a New York, and as Thor: Ragnarok promises to be incredibly weird, the overlap and inclusion of Doctor Strange makes infinite sense. Thor seems to be enlisting Strange to help him find his father Odin, whose whereabouts are unknown after Loki secretly usurped the throne in Thor: Dark World. I would give it a “B-” or “C”.